Wolf Tooth Travel Tool Wrap | Organization Deluxe ! I'm not what you would call an expert bike mechanic. 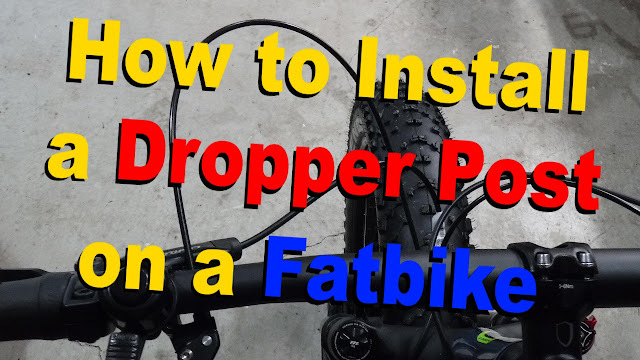 I'm quite handy at most things and over the years I have dabbled at fixing a few odds and ends on my bikes. 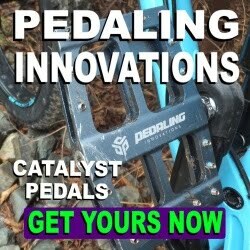 Instead of picking up a prepackaged bike tool kit I purchased the individual tools that I needed for the job when I needed them. And sometimes I would purchase a tool in anticipation of needing it. At first the tools shared a drawer in my workbench. Then they moved to their own small toolbox and finally graduated to a large toolbox where they sat in a disorganized tangle of metal and plastic. I thought about mounting some pegboard and hanging the tools (like I have done with my general tools) however wall space is at a premium. There had to be a better way to organize and store my bike tools . 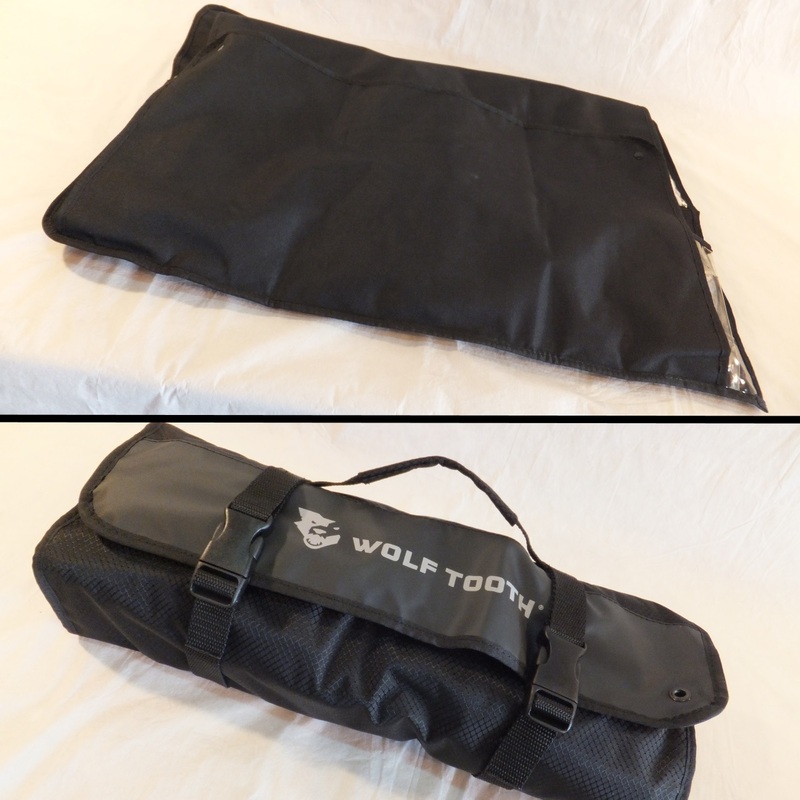 . . enter the Wolf Tooth Travel Tool Wrap. 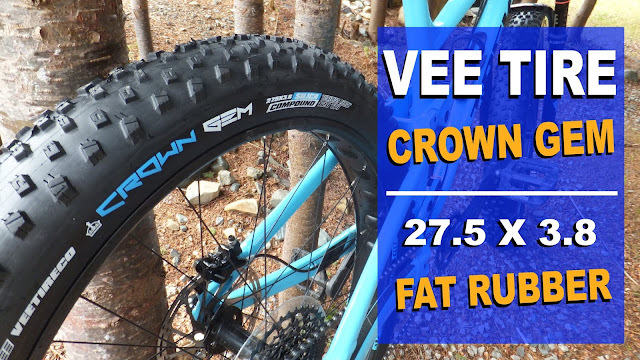 The folks over a Wolf Tooth were kind enough to send one over to see if it would help resolve the tool conundrum here at Fatbike Republic. The wrap is divided into three main sections: the top flap for hanging in a car door (23 1/2 x 7 3/4); main body for the tool storage (26 3/4 x 18 1/4); and the bottom flap work space (23 1/2 x 12 1/2). 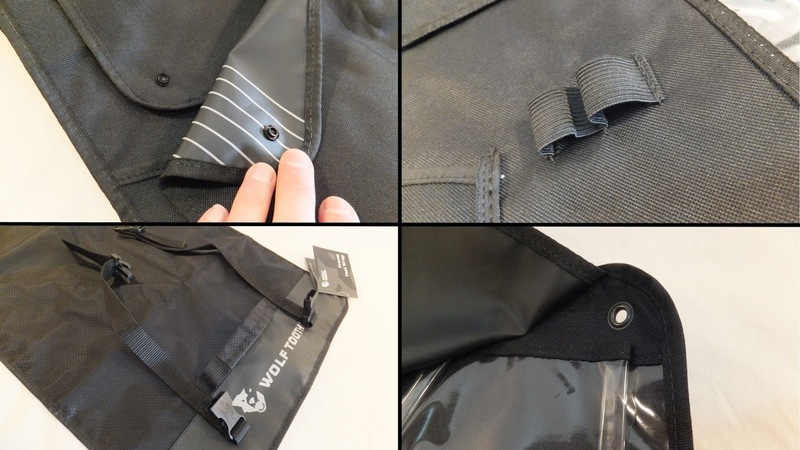 All the seams in the rip stop nylon are securely sewn, with binding used along all exterior edges for extra durability. There are 11 clear pockets (three different sizes), five deep pouches and four elastic loops for all your tools. Once loaded with tools there are snaps that connect the top and bottom flap to give the tools an extra measure of security. Once rolled there are two heavy nylon straps with side release buckles. And those aluminum eyelets for hanging are installed on the top edge of the main body. Like most of the Wolf Tooth product line the Tool Wrap is made in the USA. 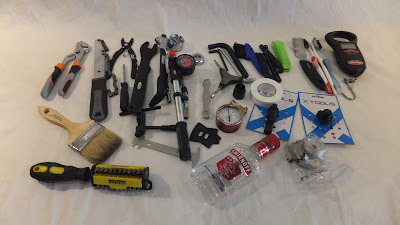 I first unloaded my tool box and had a look around the shop to see if any other tools were kicking around. The tool box was a mess and I had actually forgotten I had purchased a couple of the tools. Loading up the wrap was a bit of trial and error as the actual placement of the tools is pure personal preference. In about 15 minutes I had all the tools in their new home and in locations that made sense to me. After folding over and snapping the flaps I rolled the wrap, adjusted the nylon straps and cinched it all up. The carrying strap makes it quite handy to move around. Well . . . 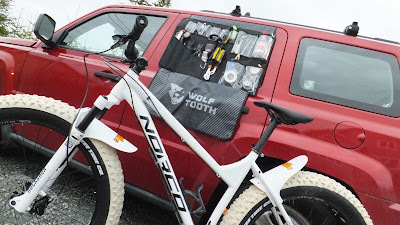 I didn't have any trail side repairs to do on my Sasquatch, but I was curious about the wrap's portability . . . so out to the Patriot I go. The wrap fit easily under the front seat out of view of prying eyes. The door flap worked surprisingly well with the paint not being scuffed. With that done it was back to the shop to hang the wrap via its eyelets. I did not have any pegboard, but I did pop two cup hooks on the underneath of a shelf. 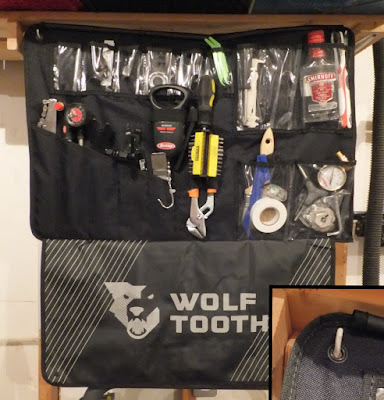 The hanging tool wrap provided easy access to all my bike tools. And when rolled it will easily fit into just about any nook or cranny you can find. No worries about a toolbox sliding off an uneven surface and spilling its contents when impacting the floor. A toolbox is just that . . . a box to hold tools. 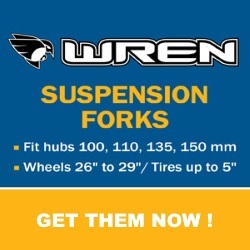 In no way does it make it easy and quick to search and retrieve the tool you need. Quick and easy search and retrieve would mean dedicated wall real estate . . . not everyone has that. 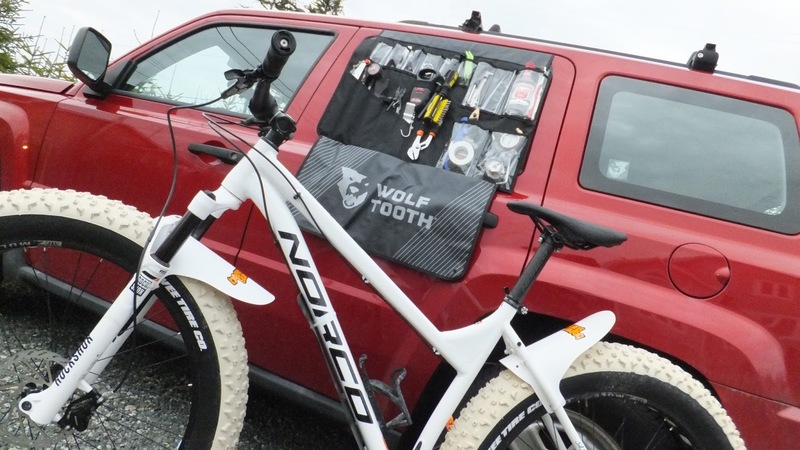 And who would love an extra set of tools to stash in the vehicle for trail side repairs. 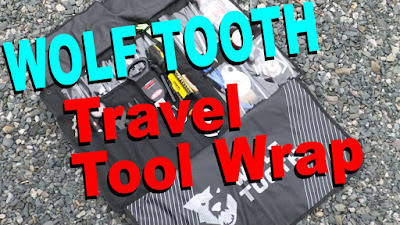 Well the Wolf Tooth Travel Tool Wrap does all that and more: stores a bunch of tools, using minimal space, giving quick and easy access and its portable. 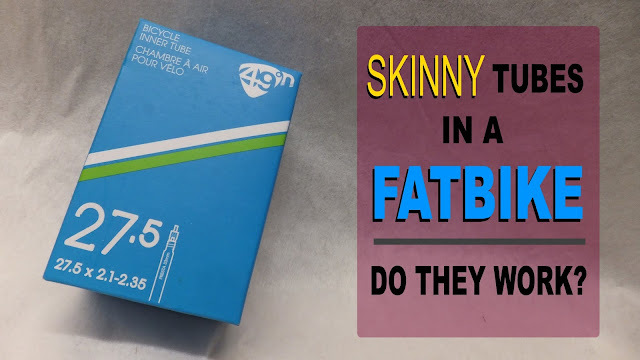 So if you like dabbling in bike repairs, are a new budding bike mechanic, or a seasoned expert . 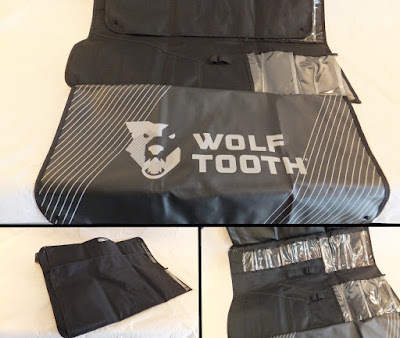 . . the Wolf Tooth Travel Tool Wrap is something that may make your life a little less complicated. 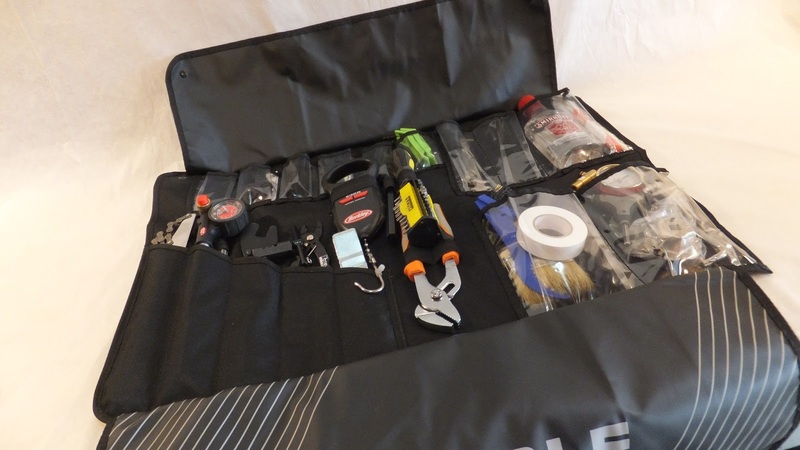 Its WAY better than a tool box! 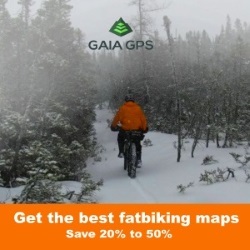 Looks pretty useful and handy !!! !